Leopards are one of 38 wildcat species in the world. Domestic cats, like leopards, evolved from wildcats 10,000 years ago. In many ways, however, the leopard is different from the domestic cat. Leopards live in Africa, Malaysia, China, and Korea. They are the most common wildcat, yet they are rarely seen by humans in the wild. Leopards normally sleep during the day and hunt at night. To hunt, a leopard sits in tree branches and waits for its victim. As a leopard hunts, it makes slow movements so its prey does not notice it. When its prey is close, the leopard lunges from the branches and kills its prey swiftly. It then might climb up a tree with its feet so other animals don’t steal it. 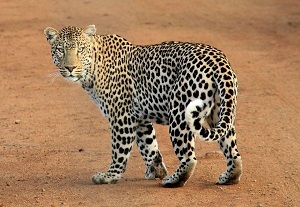 A leopard sometimes eat beetles, frogs, and birds, but it prefers to eat monkeys, pigs, and antelopes. As wildcats, leopards would not make good house cats. Because they are bigger, they need more space and access to wild prey, not cat food!